Russia has given assurances its anti-gay "propaganda" law will not affect the Winter Olympics, says International Olympic Committee chief Jacques Rogge. The law prescribes heavy fines for anyone providing information about homosexuality to people under 18. 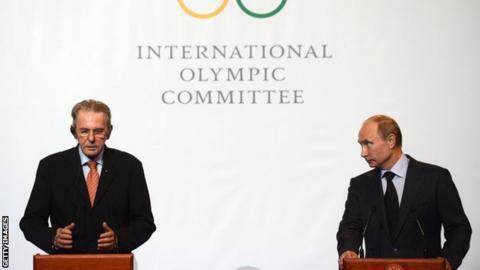 Gay rights campaigners have called for the 2014 Games to be moved from Sochi. "We have received strong written reassurances from Russia that everyone will be welcome in Sochi regardless of their sexual orientation," Rogge said. "In his letter [to the IOC], Deputy Prime Minister Dmitry Kozak underlines that Russia has committed itself to comply strictly with the provisions of the Olympic charter. "This includes its fundamental principles, according to item six of which 'any form of discrimination with regard to a country or a person on grounds of race, religion, politics, gender or otherwise is incompatible with belonging to the Olympic movement'." Russian President Vladimir Putin signed the new law in June and there are fears it could be used against athletes and spectators in Sochi. Earlier this month, IOC president Rogge asked the Russian government to explain how the law might affect next year's Winter Games. In his letter, Russian Deputy Prime Minister Kozak wrote: "The Russian Federation guarantees the fulfilment of its obligations before the International Olympic Committee in its entirety. "In particular, legislation of the Russian Federation does not stipulate any restrictions or differentiation of the rights and responsibilities of citizens on the basis of sexual orientation. "Discrimination against sexual minorities, just as any other discrimination, is expressly forbidden by the constitution of the Russian Federation." Russian pole vaulter Yelena Isinbayeva spoke out in favour of the law at the World Championships in Moscow, but later said her comments concerning homosexuality had been "misunderstood".